Below you will find an email thread between a client of ours Guy Alderman and another one of our clients Macy Ledbetter, a well respected Wildlife Biologist and Consultant. They both have graciously given us permission to share their interaction. To give some background the hunting club Mr. Alderman is a member of proscribes significant penalties if a member harvests an underage deer. 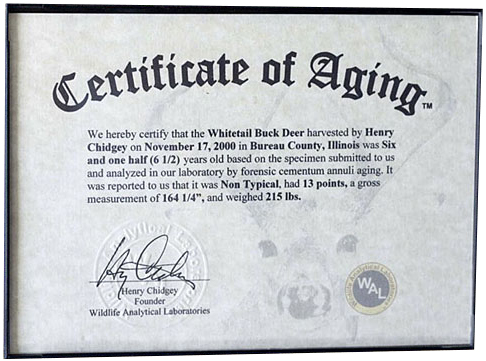 I have recently had a deer aged by Wildlife Analytical Lab and was given your name as a reference that could attest to the quality and accuracy of work that is done at Wildlife Analytical Lab and Mr. Chidgey. Our hunting club in Mississippi is under a strict management program and can only shoot 10pts that are aged at 5.5yrs of age or older. My deer was aged by our wildlife biologist using the molar wear and eruption technique and he estimated the deer to be 4yrs old. I sent the jawbone to Wildlife Analytical Lab and it was aged using the cementum annuli method and they determined the deer was 6.5yrs of age. Our board of directors is going to forward the results to our biologist and see if he agrees with the lab and changes his earlier estimate of the deer only being 4yrs old. Your opinion or comment would be greatly appreciated. Thank you for the note Mr. Alderman. For my credentials, feel free to check me out on www.SpringCreekOutdoors.com and www.WhitetailDomains.com In a nutshell, I am wildlife biologist managing with more than seventeen years experience and work on ranches throughout all of Texas and parts of Mexico and currently working with 176 different ranches encompassing just over two million acres. wild deer on ranches, I have many research projects whereby the wild deer have been ear tagged or radio collared since birth. So I have a huge data bank of available known-aged deer jaws. So in the beginning, I sent them five different sets of teeth that I knew exactly how old the deer were, even to the month, much less the year. On all five tests, they were 100% accurate. Again, they had no idea I was testing them and they got all of them correct. Next, I sent them two sets of Axis deer teeth. Now, they can age any mammal with this technique but they need to know the species of animal before they begin their tests as certain details change among the varying species. I told them the two sets were whitetails (a small white lie for research purposes is excusable!!!). In a few short weeks, Henry called me on the telephone as he had some questions about the two sets of teeth submitted. As we began to visit and he voiced his concerns and thoughts, I began to laugh and explained to him the situation. He was still able to age the deer accurately and precisely but it was the exercise and the fact that he “caught” the differences that impressed me most. He took the time and initiative to contact me with questions and those traits are admirable indeed these days. As a consultant, I recommend to all my clients to use DeerAge.com these days and they do. They do so not only for their accuracy but also for the prompt and professional service and reliability they offer. I have never seen an instance where their results were wrong in situations I KNEW were correct (mis-aging a known aged deer) but I myself have been wrong dozens upon dozens of times when I use the tooth wear and replacement method and then have them age the deer. I have been a part of multiple aging research projects in Texas and one of them is the largest and longest-termed project to date on the subject. It involved culling and comparing the two age techniques on wild deer for eight years on the famed King Ranch in South Texas. That landmark study proved, again, that the tooth wear and replacement method is just short of worthless for aging deer. The technique was originally very poorly established using a small sample size and the results were selected for the desired outcome. I use the tooth wear and replacement method every single day but NOT as the definitive answer or to decide a hunter’s fate. I use the technique to help me determine the deer’s age within a two year window with fairly accurate results. And then you throw in supplemental feeding into the equation and the technique becomes even worse for accurate. I have thirteen year old jawbones of known-aged deer that appear to be three years old. I have known-aged two year old jawbones that appear to be eight years old using the technique. Tooth wear and replacement simply does not work at all when a heavy supplemental feeding program is in place and multiple independent research projects have proven that over and over again. So, you asked me about DeerAge.com and I completely and unconditionally recommend them and stand behind their reputation, recommendations and results 100%. They are the consummate professionals and under-promise and over-deliver every time I have used them or recommended them to my clients. There is no doubt that your buck’s lower jaws did appear to show 4.5 years old and your biologist would be correct in reading the wear pattern as such. The photo of your deer’s jawbone may be identical to those in the technique’s handbook as well and so the observer would select the same answer. HOWEVER, the technique simply is heavily flawed and is not accurate at all and there is plenty of science to back that up with. This is exactly why DeerAge.com is so well accepted and used because their science IS accurate and has been proven so in multiple studies. So, nobody is wrong here, both parties are correct but they each have different answers using different techniques. The tooth wear and replacement is accurate to about two years and so your biologist and buck’s jawbone is correct. Henry’s science and technique is accurate to the single year and he too is correct by calling your buck 6.5 years of age. So nobody is wrong but Henry’s technique is much more precise. One other suggestion and I will end this reply. You may also use your buck’s harvest data and compare it to other “known aged” buck harvest data from the past. You should be able to correlate the mass measurements and main beam length and the field dressed body weights with others to help determine a four year old from a six year old. This data won’t tell you exactly how old the buck really is, but it can be compared to other cohorts of bucks with similar measurements for a good guideline. I appreciate you contacting me about this issue. I also appreciate you using DeerAge.com and I appreciate your hunting group doing good management and having harvest requirements to make the deer herd better where you hunt.